A hot tub is a large manufactured tub or small pool full of heated water and used for soaking, relaxation, massage, or hydrotherapy. In most cases, they have jets for massage purposes. Hot tubs are usually located outdoors, and are often sheltered for protection from the elements. 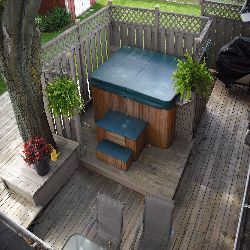 Although wooden tubs were the most common type of hot tub in the 1970s, one-piece hot tubs now dominate the market as they are less expensive to manufacture, easier to install, and more energy efficient. In most cases hot tubs are heated by using an electric or natural gas heater, though there are also submersible wood-fired heaters, as well as solar hot water systems. Water sanitization is very important in hot tubs, as many organisms thrive in a warm, wet environment. Maintaining the hot tub water chemistry is also necessary for proper sanitization and to prevent damage to the hot tub. The equipment has to be protected by a ground fault circuit interrupter (GFCI). Controls and timers should be located at least 36" or 900 mm. away from the tub. The word sauna is an ancient Finnish word referring to the traditional Finnish bath as well as to the bathhouse itself. In a conventional sauna the heat you feel is created by using steam. This steam has to warm the air around you in order for you to get the heat benefits of the sauna. In an infrared sauna, the heaters produce infrared rays or waves similar to the sun without the harmful side effects to the occupants. 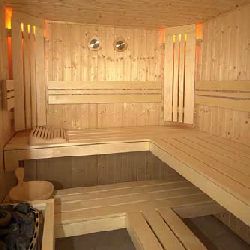 Unlike the conventional sauna, infrared saunas do not use steam but instead use infrared radiation to directly heat skin layers and heat more deeply. There is a large variety of hot tubs and saunas on the market, some are permanent while others are portable. So, do your homework before deciding what is best for your needs.